Conducting a Conference is beset with certain inherent risks. Scheduling it especially on a Sunday morning when weather is absolutely right for lazying around, you do not know how many would turn up. And if the Conference is on religious matters that does not contain even a single ‘cultural item’ its much worse. Ruminating with some sort of anxiety on these lines, I reached the Westville Campus of UKZN on Sunday, the 30th September 2012 fifteen minutes before the Conference began. What I saw was something unimaginable. The Hall was packed to its capacity! 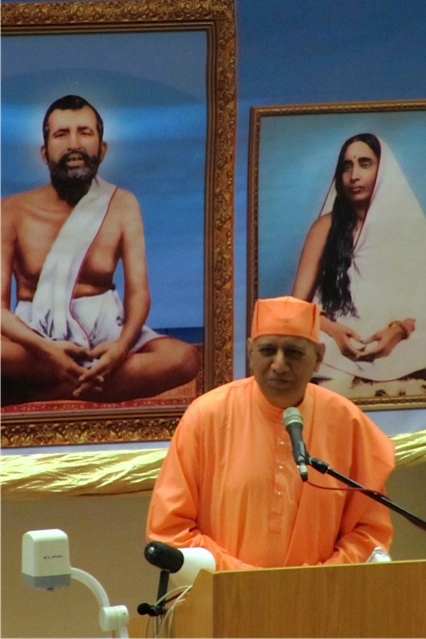 This Conference entitled “Hinduism – The Way Forward” was convened by Sri Sarada Devi Ashram (SSDA) of Durban. On arrival, I could clearly discern the devotion of the members of the SSDA and how they were working in unison. At various points of the campus, the volunteers were guiding delegates to the parking lots and venue. Reaching nearer to the venue, I could also observe how the lady devotees of the Ashram warmly welcomed every one. 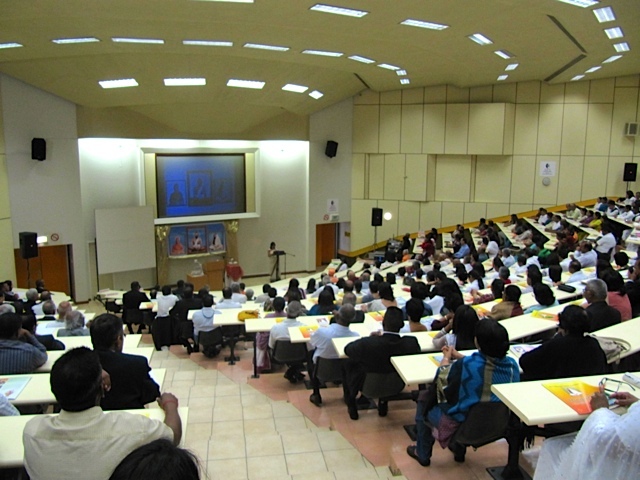 They duly directed the speakers and guests to T-Block where, after registration, each delegate was given a Conference pack and led into the lecture theatre. Well, I was thoroughly pleased to get a detailed Report from Ms Shiksha Ramkissoon who is a devotee of SSDA. Professionally she is a Physio-therapist attached to a hospital. Her Report is lucid, presenting a vivid picture of what happened at the Conference. I do hope our reader-devotees enjoy this Report. Images courtesy: Lushen Pillay. The clear skies and the Durban warmth presented a perfect backdrop for a Sunday morning of discussion on some of Hinduism’s sacred texts. 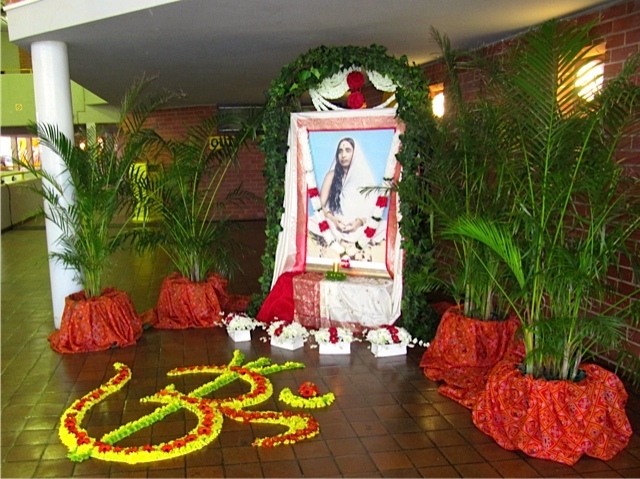 The foyer outside T1, the venue of the Conference, was converted into a small shrine with a beautiful garlanded picture of Holy Mother Sri Sarada Devi surrounded by plants, bouquets and an artfully created ‘Aum’ symbol made with flowers. It was complemented by a slide show of spiritual quotations on a digital screen above the entrance. The backdrop at the podium in the hall, was adorned with a stunning banner of an image of the Holy Trio highlighted by a beautiful gold drape around it. By 9 30 am the room was filled with over 700 guests. His Holiness Revered Swami Brahmarupanandaji Maharaj, a senior monk of the Ramakrishna Order based in Ulsoor, Bangalore, India, graced the Conference with his presence. Also present, were His Holiness Revered Swami Vimokshanandaji Maharaj and His Holiness Revered Swami Saradaprabhanandaji Maharaj. 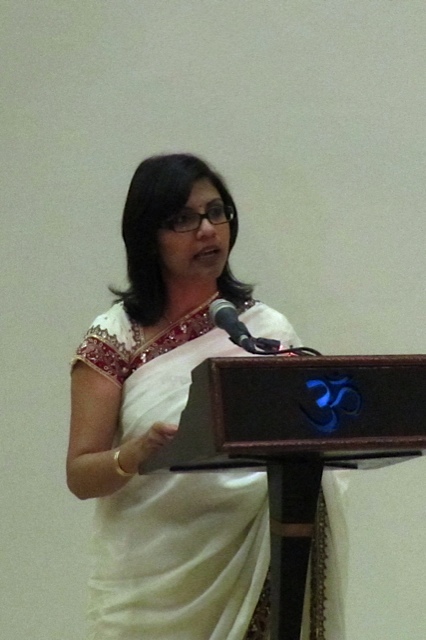 The program director was an attorney Ms Prakashnee Gengan, the Chairperson of SSDA. 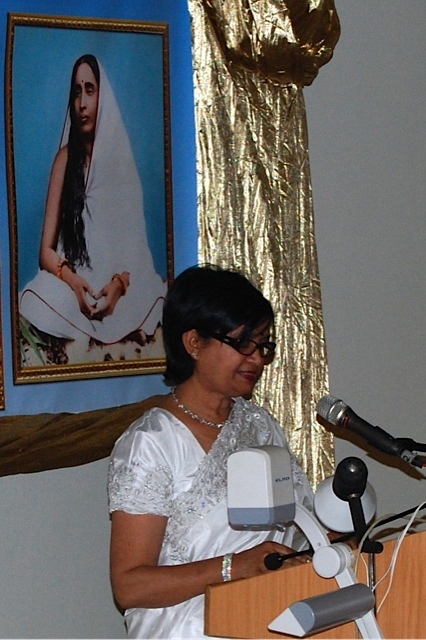 Sister Avinta Badrinath led the congregation in prayer, before Her Holiness Pravrajika Ishtaprana Mataji lovingly welcomed every delegate including the Revered Swamijis, members of sister organizations and those who had travelled from far and wide to attend the Conference. Ms Gengan elaborated on the theme of the Conference and the topics which were to be presented. They were based on two popular scriptures, viz., the ancient and eternal Ramayana and the modern day Gospel of Sri Ramakrishna. The first speaker was Swami Saradaprabhanandaji Maharaj, Vice-President of the Ramakrishna Centre of S.A. whose topic “Crime in the Ramayana – Challenges and Solutions” was discussed in a detailed and scholarly manner. 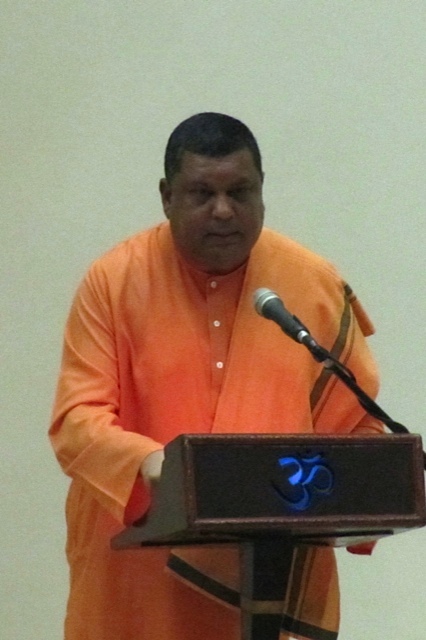 Citing specific incidents in the Ramayana from the perspective of criminology, Swamiji’s talk provided a new perspective on the cause, prevention and management of crime and demonstrated that the scriptures provide the answers not only to our spiritual lives but also to the challenges that we face in our daily lives. Swamiji began by tracing the cause of crime by quoting from the Bhagavad Gita in which Arjuna asks Lord Krishna what impels a man to commit sin, as if by force. The Lord replies that it is desire and anger, born of rajas, which are the root causes of this behavior. Swamiji then highlighted the various characters of the Ramayana who committed various crimes, starting from Ratnakar, to others such as Ahalya, Surpanaka, Ravana. These examples enforced the point that unbridled desire indeed is the source of crime. Swamiji explained that criminal desires are to be managed before they are expressed. For this, the tool of self-control is essential. He identified personalities such as Lord Rama, Mother Sita, sevak Hanuman, Queen Mandodari and others who displayed a great degree of self-control. He added that this should be adopted by Hindus as a means to prevent crime. Characters who displayed poor self-control were Vali, Ravana, Kumbhakarna, Indrajit. He gave examples of different kinds of graded system of punishment that was meted out in the Ramayana. He identified three dimensions of combating crime, viz., individual goodness, a single individual becoming proactively good on his own and an individual working in a team, a pressure group or organization. All have to be done within the parameters of the law. Valmiki constructed a complex crime scene in which Sita, who was untrained in self-defence, was abducted by Ravana who used disguise to deceive Her. Sita is initially portrayed as a victim of crime, but Valmiki showed that righteousness eventually prevails and Sita emerges as a survivor of crime. The Ramayana thus has many episodes of crime but eventually proves that criminals are never victorious. The congregation then adjourned for a refreshment break. The second session saw the remaining three papers being delivered. The first speaker in this session was Swami Vimokshanandaji Maharaj, President of the Ramakrishna Centre of S.A. who presented his Talks, undoubtedly the highlight of the Conference, on ‘Prayer in Daily Life – According to the Gospel of Sri Ramakrishna’. Maharaj expanded on all points by using examples from daily life, effectively bringing in humour, which left the audience roaring with laughter whilst simultaneously further imprinting the message and concepts into their minds. Maharaj explained that prayer is a powerful tool found in all religions. In Hinduism, the importance of prayer was forgotten over the years, while other spiritual practices, like self-enquiry, yoga etc., were developed to a great extent. With the advent of Sri Ramakrishna, ‘prayer’, as a fundamental spiritual tool, was highlighted again. Maharaj defined prayer as the simple act of talking to God. Prayer, as it is usually done, (Maharaj called this the preliminary stage, or a petitionary prayer) begins by asking God for something. There are people who criticise this type of prayer as being materialistic or unnecessary, as God is Omniscient and hence knows our inner desires. Maharaj explained that this type of prayer should not be condemned as, without this, millions of people would not think of God at all. Moreover, the acquisition of material possessions, artha, and fulfilment of desires, kama, (done within the framework of dharma) are legitimate goals of life. Since God is our very own, there is nothing wrong in asking of Him what we want. Maharaj pointed out that, when praying, we should discriminate between a prayer for a particular need and a prayer for a want. Not all prayers are answered since God will provide what is needed and not necessarily what we want as that which is wanted, is not always good for us or we may not be capable of taking care of it. The manner in which we pray is also important. Since God is our own, our conversation with Him (or Her) should be in our own mother tongue (or the language that we understand), with tears in our eyes and sincerity of heart. Since God is Omniscient and Omnipresent, there is no specific time or place that is set for prayer. Even though prayer is considered a lower form of spiritual practice, Maharaj emphasised that it is a fundamental practice as it opens our hearts, brings balance to our spiritual life and helps us overcome any difficulties/complications that may arise from other spiritual practices. As we progress in our spiritual life through the means of prayer, the nature of the prayer itself changes. As our hearts grow, asking for ourselves expands to asking for others – be it wife, children, family, neighbours, country, etc. Finally, as we realise that God provides all our needs, it changes from asking for things to a pure love for God when we continuously think of/communicate with God, just want to be with God and surrender completely to God. The next paper was presented by Dr Nirmala Balkaran. Her talk entitled “Nurturing children and youth – the Ramayana Way” was accompanied by a PowerPoint presentation which had charming pictures of little children, including a stunning cover picture of baby Rama. The core of the speech was the examples of the parenting of King Dasharatha and Mother Sita, the education and nurturing their children received and how these ideals can be implemented in modern society in response to challenges that are faced by parents and teachers today. She discussed in detail how the sons of King Dasharatha, from a young age, were given a well-balanced secular, vocational, artistic and spiritual education by their father, Guru and other teachers assigned by their father, both directly and indirectly through exposure. The importance of stimulating the child by the reading of religious texts from the foetal stage to adolescence was highlighted. Dr Balkaran described Mother Sita as a single parent who, even under difficult circumstances, ensured that her children Luv and Kush received a balanced, well-rounded education that catered to their physical, intellectual, moral and spiritual development under the tutelage of sage Valmiki. In contrast, the current school system merely provides a secular education which is a stepping stone to tertiary institutions that endow one with the necessary skills to earn a livelihood. As important as that is, it is not sufficient for the development of the entire personality of a human being, for as Swami Vivekananda says, education should be “man-making, life giving and character-building”. Hence there is a need for parents to involve their children with organisations that provide programs which offer moral and spiritual education and promote a holistic and balanced development which includes the growth of character and morality. 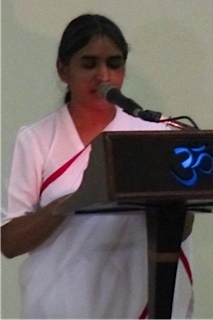 The final paper entitled “Illuminating Parables on Spirituality from the Gospel of Sri Ramakrishna” was presented by Pravrajika Ishtaprana Mataji. Mataji chose certain tales from the Gospel as told by the Master. These contained deep spiritual truths and guidelines for spiritual life. Mataji’s simple description of the stories and the animated pictures on the PowerPoint presentation made it easy for the audience to relate to the parables. 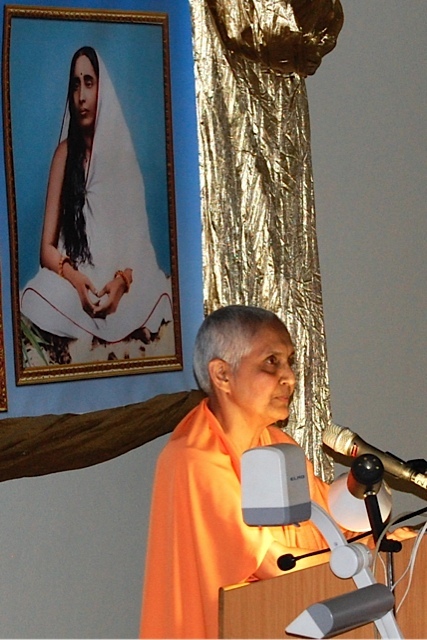 Mataji described the Gospel of Sri Ramakrishna as a “scripture which clearly points the way forward”. The popular stories provided insight on topics such as the nature of God, both form and formless; the grace of the Guru; renunciation; causes of conflicts between practitioners of different religions/sects; obstacles in spiritual life; and spiritual practices including concentration of mind. She encouraged all to take the Gospel and read a little daily to imbibe some of the lessons from them. After each talk, there was a short question and answer segment, which drew brilliant answers from the panel of speakers to the various interesting questions from the audience. There were also some abiding comments and observations from the audience. At the end of the Conference, the speakers were presented with tokens of appreciation by devotees of SSDA. Sister Avinta brought the Conference to a close with her mellifluous shanti paath recital before all proceeded to the foyer where a sumptuous lunch was served. The general consensus of those present was that the Conference was a ‘major success’ and ‘well organised’. It was indeed a morning well spent! The credit singularly must go to Holy Mother Sri Sarada Devi whose infinite grace seemed to be over flowing that day! Many more such meaningful mornings will make meaningful life. sure. I am in Kanyakumari today in a meeting for Sardhshati Samaroh. Thanks for your visit to this site and appreciative remarks! Hope you are enjoying the samaroh in Kanyakumari! The place reverberates every where the clarion call of Swamiji who sat on the tip of our motherland and saw the glorious India rising once again, this time more glorious than ever before. May Swamiji inspire you ever! Congratulations on a beautiful Conference which was so inspiring and made me proud to be a Hindu and part of this glorious event! Yes, if this Conference has created that wonderful ‘pride’ about one’s own religion, I think the organisers would consider their efforts amply rewarded. May the ever gracious Lord help us in sustaining a worthy society! This was an excellent Conference – all round, from the welcome, meals and above all, the high quality presentations. The themes resonated with the social challenges facing SA. The challenge is to engage various stakeholders beyond the conference on these themes. The audience included a number of social thinkers, professionals involved in Law, Teaching and Medicine and other disciplines. From the feedback I have no hesitation to state that the themes generated a widespread interest in meeting the challenges. And one day we can hope that it would take a concrete form. Thank you for forwarding this very invigorating presentation. My only regret is that I did not attend. I will definitely make a concerted effort to attend in future. I have found the content of the presentation to be very appropriate, meaningful and very interesting. Thank you for providing a summary of all the presentations for us who could not attend the conference. Sorry to note that you could not attend the Conference. Yes, indeed those who have not attended missed something special. I received messages/tele-requests from more than 20 people requesting me to provide the details of all the Papers presented at the Conference in my blog. None of them could attend it because of various personal reasons. 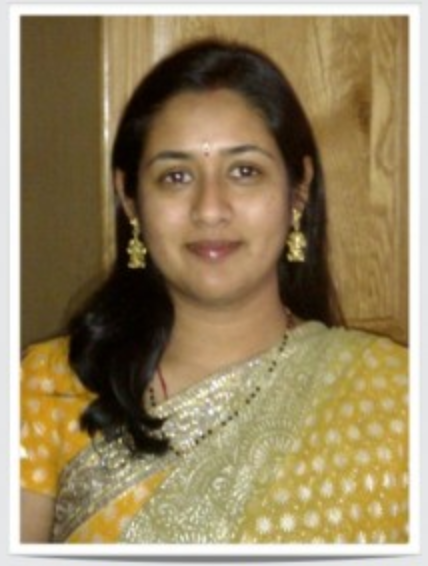 When I asked Shiksha Ramkissoon to furnish a write-up, she readily agreed. Thanks should go to her for sending me the requested article within just 48 hours! an absolute way forward……proud hindu, we can stand up with pride. Whenever I enter the premises of Sri Ramakrishna Math, either in Mylapore, Chennai; Pune or in recent times, Vivekananda Mission Memorial at Dinaram Bungalow, Baroda..I feel the vibration of Guru Maharaj. After abrubtly being transferred from Coimbatore to Godhra in August 2011.. leaving my wife, daughter,parents, brother and relatives, I came to Godhra with a broken heart..With certain recent past events clouding my heart and with the burden of loneliness, I was forced to shirk my responsibility towards my family (my only daughter in the most crucial phase of her education; studying in 10th standard), the very first thing I did after I received my transfer order to Godhra was to see where Ramakrishna Math is located near Godhra. By Guru Maharaj’s grace, I could find out that there was a Ramakrishna Math (Vivekananda Mission) at Baroda..some 70 kms from Godhra. That place i.e. Dinaram Bungalow has been sanctified by the stay of Swamiji in the year 1992..and you can imagine what kind of vibration it will have. Immediately on reporting to my office, the very first thing I did on Sunday was to visit the Mutt at Baroda. I met the Vice President Swamiji and President Swamiji. President Swamiji asked me the first question ‘Have you taken lunch? You take prasad here today”..that simple words filled with love and compassion broke me ..and I cried..At the age of 45, I cried like a child..who else can probe your loneliness and who else can show such compassion except Guru Maharaj. Guru Maharaj and all Brahmacharis, Sannyasins and volunteers of Ramakrishna Mutt are nothing but embodiments of infinite compassion. I have already spent one year in Godhra..and all along, my solace, my comfort, my very purpose of living..is due to the divine Grace of MY GURU MAHARAJ. GURU MAHARAJ! Bless your child and Bless all those beings who surrender in thy divine feet..JAI SHRI RAMAKRISHNA..I SURRENDER TO THE HOLY TRINITY…LOVE ALL. From your experience that you have so wonderfully recounted, you seem to be a true bhakta. Or else you would not not been showered with His so precious grace! Thanks for your visit to this blog! You are most welcome to give us your comments/observations etc. from time to time under different posts. A close devotee – (recently) late – Bharatji from Mumbai used to call reading of this blog as eSatsang! The core principle of spirituality of a devotee is surrender, absolute surrender. And once that happens everything is taken care of by that Supreme.